There’s a number of options for travelling to and from Dubrovnik Airport. Whatever option you take, make sure you look at the stunning coastal scenery during the transfer! If you’re heading to the Old Town, it is probably advisable to get a bus rather than a taxi. Not only is it cheaper, a taxi obviously can’t get you any closer to your final destination in the pedestrian-only Old Town than a bus would! However, although the bus is timed to coincide with flight arrivals at the airport, you may find yourself having to wait for a little while (which shouldn’t really be longer than 15 minutes) for the bus to arrive. (The bus is obviously bringing travellers to the airport, too.) In you’re in a rush, you may prefer to take a taxi. The airport bus also drops people off at the western entrance to the Old Town, Pile Gate – so if you would prefer to be taken to eastern Ploce Gate, you might like to consider taking a taxi. Tickets for the bus cost 40 Kuna, and there is no extra charge for luggage. Once you are seated and before the bus has departed, the driver (or assistant) will come round the bus selling tickets. Journey time is around 30 minutes. This bus drops you off at the eastern Pile Gate, as mentioned. This can be quite a busy drop-off spot for all sorts of other buses and taxis, so be prepared to grab your bag and make a quick exit amongst the crowds and traffic. Just outside Pile Gate – if you get a bus from the airport, you’ll be dropped off here! For those not in such a great rush, there are local buses that travel to/from the airport which obviously make a number of stops along the way. 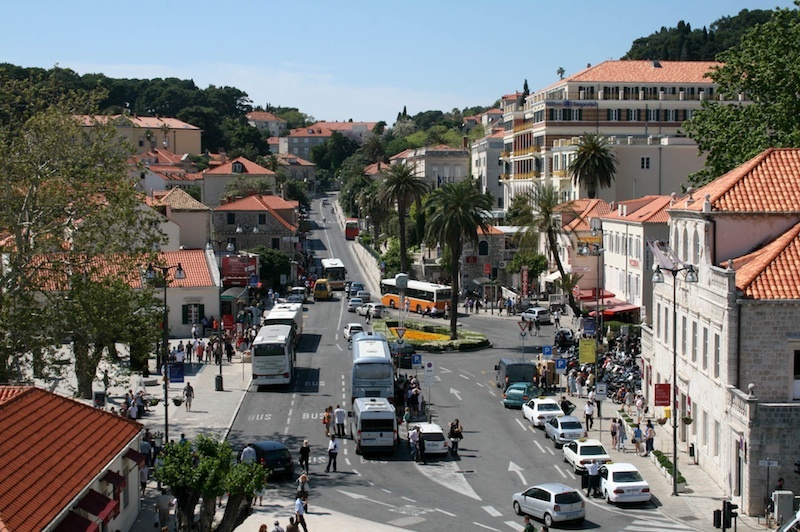 Buses 11 and 27 travel between the airport and Dubrovnik; you can also transfer to other buses if your final destination is somewhere else in between. Tickets cost 15 Kuna if purchased on the bus (which is the most likely option, seeing as you’ve just arrived by plane) or 12 Kuna if you manage to pre-purchase a ticket at a newspaper kiosk. You can find local bus timetables for Dubrovnik at www.libertasdubrovnik.com. Not only is there a taxi rank just outside Dubrovnik Airport, but you may also find yourself “greeted” by an enthusiastic guy that seems to organise the taxis lined up at the rank. Don’t worry, he’s perfectly legal, but perhaps just a little too eager to offer up the taxis. A taxi to the Old Town should cost around 170-200 Kuna. One final idea would be to take the airport bus to Pile Gate, and then take a taxi from here to your final destination. When you disembark the bus at Pile Gate, you will see a taxi rank in front of you. A taxi to destinations on the Lapad peninsula should be around the 60 – 70 Kuna mark.